Fastrac Blox is a neurotoxin and there is no antidote if children or pets consume the bait. If you have children or pets, it is recommended that you use Contrac Blox since every doctor and vet has the antidote, which is Vitamin K1. 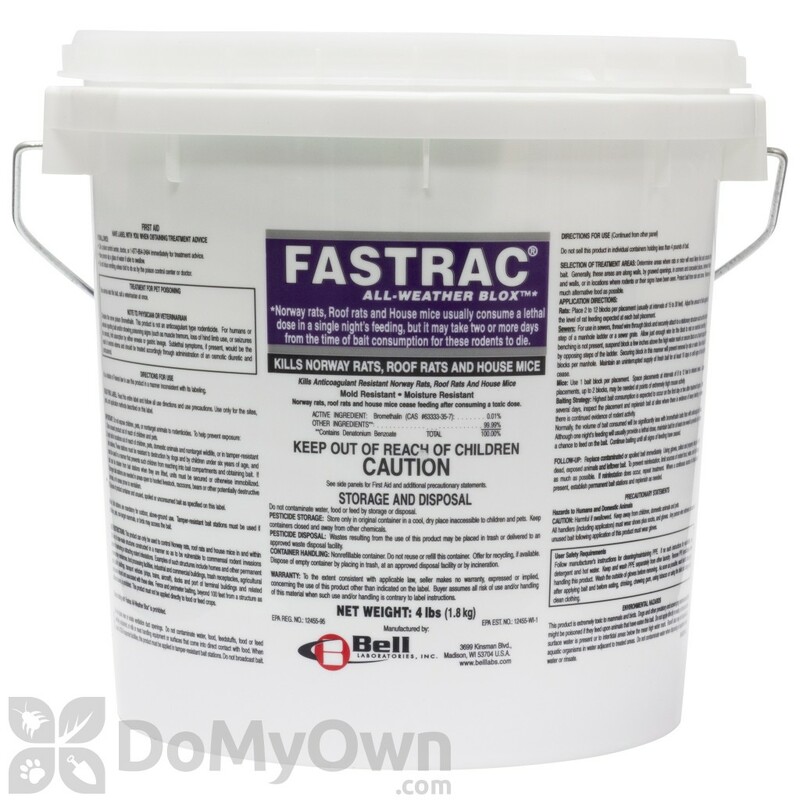 Fastrac All-Weather Blox from Bell laboratories is a quick and effective solution to controlling populations of rats and mice, especially Norway rats, Roof rats and House Mice. Fastrac Blox are small, rough, all-weather baiting blox with many gnawing edges. A hole in the center of each block allows it to be placed on bait securing rods in tamper resistant bait stations. They are colored purple for easy identification. BLOX work well in any condition -- wet or dry, indoors or out. Fastrac Blox offers a lethal dose of active ingredient bromethalin in a single feeding, with the first dead rodents appearing in one or two days after bait consumption. 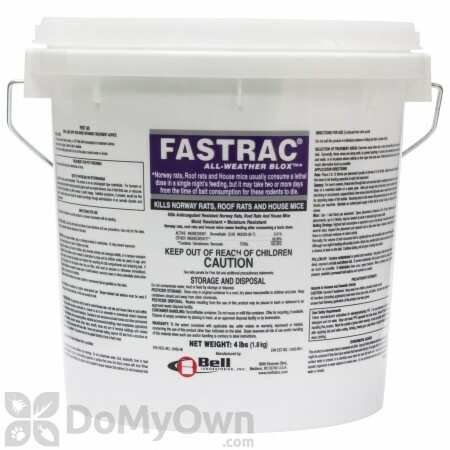 Fastrac Blox from Bell laboratories is a quick and effective solution to controlling populations of rats and mice, especially Norway rats, Roof rats and House Mice. Fastrac Blox are small, rough, all-weather baiting blox with many gnawing edges and a hole through the center for placement on Protecta Bait Station securing rods. (However, this bait may be used in any bait station). They are colored purple for easy identification. BLOX work well in any condition -- wet or dry, indoors or out. Fastrac Blox offers a lethal dose of active ingredient bromethalin in a single feeding, with the first dead rodents appearing in one or two days after bait consumption. The active ingredient bromethalin poisons the central nervous system, causing the rodent to stop feeding after ingesting the poison, so more rodents can be controlled with less bait. 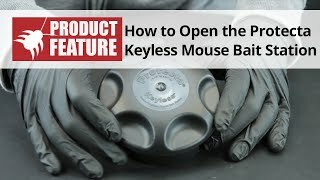 Determine areas where rats or mice will most likely find and consume the bait. Generally, these areas are along walls, by gnawed openings, in or beside burrows, in corners and concealed places, between floors and walls, or in locations where rodents or their signs have been seen. Protect bait from rain and snow. To increase effectiveness, remove as much alternative food as possible so that rodents will seek the bait first. For rats, place 2 to 12 blocks per placement (usually at intervals of 15 to 30 feet). For mice, use 1 bait block per placement at intervals of 8 to 12 feet in infested areas. Dead rodents will begin to show up in one to two days, and should be disposed of immediately. Warning: This bait does not have an antidote. In other words, there is no known agent to neutralize or counteract the effects of Bromethalin poisoning. While it does take a relatively large amount of bait for poisoning to occur, children, pets, and non-targeted animals should not be exposed to Fastrac Blox. Available in 128 x 15 (4 lb bucket of 15gm blox) resealable pails. A hole in the center of each block allows it to be placed on bait securing rods in tamper resistant bait stations. For control of Norway rats, roof rats and house mice. When used in USDA-inspected facilities, this must be applied in tamper-resistant bait stations. Do not broadcast bait. This may be used in and around the periphery of homes, industrial, commercial, and public buildings. May also be used in transport vehicles (ships, trains, aircraft) and in and around related port or terminal buildings. May also be used in alleys. This may be used inside of homes and agricultural buildings. Determine areas where rats or mice will most likely find and consume the bait. Generally, these areas are along walls, by gnawed openings, in or beside burrows, in corners and concealed places, between floors and walls, or in locations where rodents or their signs have been seen. Protect bait from rain and snow. Remove as much alternative food as possible. Place 2 to 12 blocks per placement (usually at intervals of 15 to 30 feet). Adjust the amount of bait applied to the level of rat feeding expected at each bait placement. Thread wire through block and securely attach to a stationary structure such as the bottom step of a manhole ladder or a sewer grate. Allow just enough wire for the block to rest on manhole benching. If benching is not present, suspend block a few inches above the high water mark or secure block on a board supported by opposing steps of the ladder. Securing block in this manner will prevent removal by rats or water. Use at least 15 blocks per manhole. Maintain an uninterrupted supply of fresh bait for at least 10 days or until signs of rat activity cease. Use 1 bait block per placement. Space placements at intervals of 8 to 12 feet in infested areas. Larger placements, up to 4 blocks, may be needed at points of extremely high mouse activity. Highest bait consumption is expected to occur on the first day or two after treatment begins. After several days, inspect the placement and replenish bait at sites where there is evidence of heavy feeding or where there is continued evidence of rodent activity. Normally, the volume of bait consumed will be significantly less with bromethalin baits than with anticoagulant baits. Although one night's feeding will usually provide a lethal dose, maintain bait for at least one week to provide all rodents a chance to feed on the bait. Continue baiting until all signs of feeding have ceased. Collect and properly dispose of all dead, exposed animals and leftover bait. To prevent reinfestation, limit sources of rodent food, water, and harborage as much as possible. If reinfestation does occur, repeat treatment. Where a continuous source of infestation is present, establish permanent bait stations and replenish as needed. I have used Fastrac Blox in tamper resistant bait stations around the farm buildings and grain bins for the past 4+ years to prevent rats. The bait has done an excellent job and is long lasting in the bait stations, whether they are placed in the farm buildings or outside by the walls. I have placed some of these around my mother’s house (in a city) where roof rats have been found and they seem to be gone as well. The key reason I chose and continue to use these blocks is the active ingredient Bromethalin. Based on my research, this is the fastest acting agent, much faster than the anticoagulant baits. I can also use less of it per bait station, since the rats die sooner and do not come back to feed as often. I have found dead mice that never made it out of the bait station. In fact, I notice that I never run out of bait, before it is time to change the blocks out (every 6 months or year, depending on whether the bait station is indoors or out). When I started out, I changed the bait more frequently, but now I am in ‘maintenance mode’. Do My Own Pest Control has met my expectations with regard to customer service. I have called them several times, and have bought other products from them. Shipping speed is excellent. I plan to continue to purchase my bait needs from them. Put the bait down, and we had dead quiet within days. What was possibly a burgeoning population in our partially inaccessible crawlspace has ceased to exist. I had thought that we'd be able to crawl through and collect at some of their little stinking bodies, but we can't seem to find any. They seem to be in the footings of the walls. So, there has been a smell (worst in the first 4 days, but now two weeks later is barely noticeable), but with some creative air venting with some fans through an upstairs window, it wasn't too much of an issue. Not a perfect solution, but trapping wasn't working for us anymore, and I'm glad we went this route. Definitely recommended. We had/have a problem with Norway rats invading and eating the food we set out for our outdoor cats. We previously used Fastrac bloxs in rat bait traps but the rats wouldn't eat from them. We left the Fastrac bloxs loose on the ground (always supervised) in the hopes the rats would munch on them. No luck. Finally, we crushed the Fastrac blox and mixed them with the canned cat food the rats seemed to enjoy. The rats ate their fill eagerly and by the next evening only 1 of the 22 rats we counted the previous night were left! We will definitely use Fastrac blox again, if needed. I can control the rats around my house for a small fraction of what one of the big outfits would charge me. We have an acre with lots of ivy and fruit trees, rat heaven! Not any more. The supplies I have bought from DMOPC are professional quality and priced right (I shopped around). Do a little research and handle those rascals yourself, save big MONEY. Received the Fastrac Blox(s) and Protecta LP Bait Station within days of the order. The video demonstration including customer support to set-out the Blox(s) in the stations was excellent. Very pleased with the purchase, this company not only has quality products but the best customer support. What can I do to get rid of an outdoor rat problem? I have been battling an outdoor rat problem for some time now. The problem is in my front yard, and I live in a row of town houses. I believe the problem is coming from under my neighbors deck. They have a lot of clutter and garbage. I've called the NYC Department of Health, and they have come out a few times but done nothing. In May, I purchased three bait boxes and filled them with Contac blox and Fastrac blox. I also (with the neighbor's permission) threw some poison under their deck into the burrows. Over the next few days, we found about seven dead rats. I thought the problem was over. I have not seen any more dead rats since, but the bait goes missing. Could they not be dying? Dying elsewhere? Could there be so many rats that the problem isn't resolved six months later? Last night, I heard some banging around outside. I looked out my window, and I saw what seemed to me a HUGE rat with it's head in the bait box. It was trying to get its body in but couldn't. It just kept moving the box around. When it finally gave up it, it walked across my front yard and activated my motion light. I could see more clearly, but I couldn't see its face. This was bigger than any rat I have ever seen, and it had a very long, hairless tail dragging. It was brown, the size of a cat, fat and was waddling. Could this have been a rat? I live in NYC, there isn't much wild life here. I'm not sure what else to do or if anything can be done about my rat problem. This is very nerve wracking coming home after dark and wondering if you're going to spot a rat. You are on the right track, but you may need to put out more bait boxes in more locations around your property. Once the rat eats the bait, they will usually be dead in 1-5 days depending on which bait they ate and how much of the bait they ate.Rats will die wherever they succumb to the bait which may or may not be in a visible area. Be sure to keep the bait boxes filled with fresh bait for best results. And yes, you could potentially have a rat population so large that it takes many, many months to get rid of them. Another explanation of course is that nothing has been done in the way of cleaning up your neighbors property, so new rats keep moving in to take over the space left behind by the rats that you have already eliminated. As for the huge "rat" that is the size of a cat that could not fit into the bait box? This was most likely an opossum. Rat bait boxes are made so that larger animals like raccoons and opossums cannot fit inside of it to avoid accidental poisoning of non-target animals. Is there an expiration date on the Fastrac Blox? No. We recommend using the bait within a year of the purchase date. While the active ingredient will last indefinitely, rodent baits include food based ingredients and can start to degrade over time making them unattractive to rodents. You should store bait in a cool, dry environment to keep them fresh longer. Which rat bait poison do you recommend for use in the stations? Our three most popular rat baits are: Fastrac Blox- which offers the fastest kill (about 12-24 hours) and is considered the top choice for rodent infestation cleanouts. 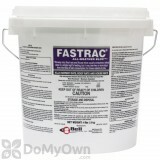 Many folks choose Fastrac Blox because it is one of the few that can still be purchased in the smaller 4 lb pail. Contrac Blox - kills in about 3-7 days and is usually chosen as a maintenance bait. Contrac also has a readily available antidote in case of accidental ingestion by non-target animals or children. Final Blox - Kills in about 2-4 days and is used when there is still a high pest pressure and then as a maintenance bait. Will the dead rats killed by this poison effect other animals should they eat the rat carcass? Rats that have eaten the bait and then die are supposed to be removed and disposed of if they are found. Animals that eat exposed carcasses will usually have to eat many carcasses before they receive enough bait to have a reaction, but a secondary poisoning is possible. Terad3 Blox is a newer product that has a lower risk of secondary poisoning should a predatory animal eat a rat carcass. Can I dip Fastrac Blox in bacon grease? I've used bacon grease to attract norway rats to a bait station in the past, and they seemed to love it. Can I dip Fastrac Blox in bacon grease before placing them in the bait station, or will this affect the poision? We do not think dipping Fastrac in bacon grease would affect the poison in the bait, but the bait is made from food sources to attract the rodents. 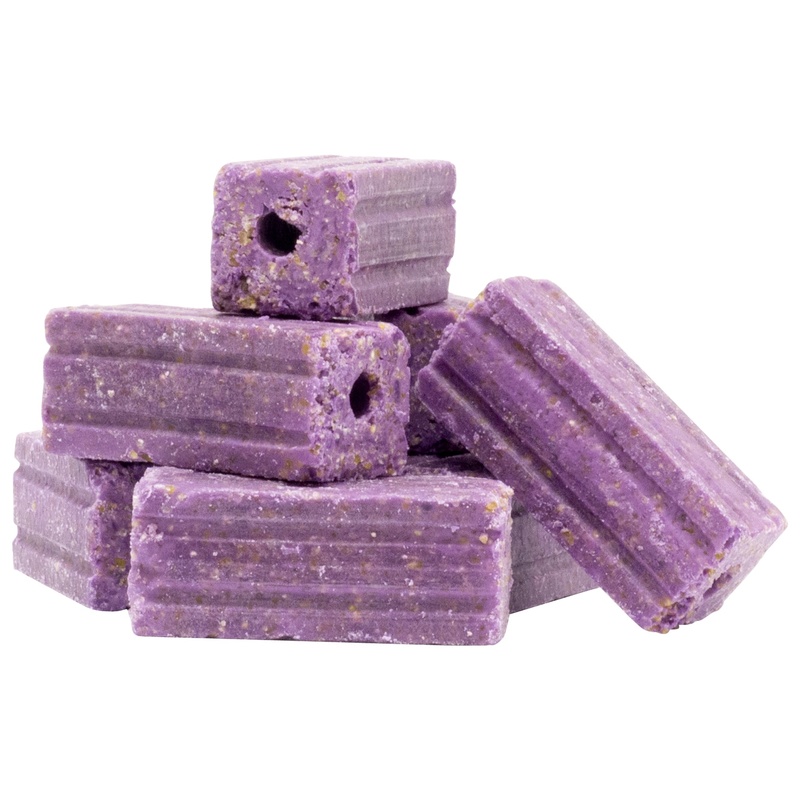 We would recommend trying the bait as is at first as it is manufactured to be attractive to rodents as it is.